Unsure of exactly what to expect (or how I’d react to what I saw), I headed off to the highly anticipated traveling exhibit that is making its Virginia debut at the Science Museum of Virginia, Gunther von Hagens’ Body Worlds and the Brain. Inhabiting over 9,000-sq. ft. on the lower level of the museum, over two hundred authentic human specimens are on display. Pieces, parts, organs, cross- sections, entire bodies – preserved through a revolutionary process called plastination. The first question parents reading this will surely want answered (and lots of calls are coming into the Science Museum already) is this one: Is it appropriate for kids? It depends. You know your kids best and only you know if they’ll think looking at the human body like this is cool, interesting, and fascinating, or disgusting, creepy, and scary. The official age recommendation? Eight and up. But if you’re thinking about taking the kids, keep in mind that ALL of the parts are on display (yes, those parts). So if your kids are likely to get weirded out by dangling — well, you know, then it might just be a better outing for you and your middle-schooler or teen, or a lunch date with your spouse or a friend. That said, the bodies and parts are all displayed in very tasteful and yes, artful, ways, with wonderful cases and lighting to highlight the exhibits. Several forms are not enclosed, but there’s no touching, of course. Just fyi, the words creepy, gory, or scary didn’t pop into my head – even once. With a focus on the brain, the exhibit also merges anatomy with the latest findings in neuroscience. It demonstrates discoveries of brain development and function as well as brain performance and improvement. Also featured here are brain disease and disorders along with time-lapsed MRIs that show the development of the brain from childhood to adolescence. Other highlights include an exploration of the brain’s influence on the body and a look at how Alzheimer’s physically affects the brain. Folks I’ve talked to seem particularly interested in seeing parts of the body that stem from a connection or elicit a personal response – whether it’s the friend who had knee surgery who couldn’t wait to see what an ACL actually looks like, or the colleague who plans to take her still-smoking husband so he can see just what a smoker’s lung looks like. I was fascinated to see a spinal column up close and personal and be able to pinpoint the exact vertebrae that I had fused two years ago. The smallest bones in the skeletal system, the inner ear bones, were cool to see, as was the plastinated pair of lungs, one with cancer and one without. An amazing exploration of anatomy, truly. 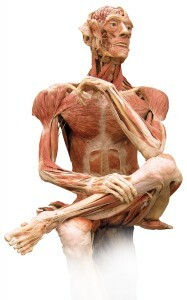 There are twelve actual human bodies in the exhibit, each specifically positioned to serve educational purposes and illustrate different anatomical features. For example, the athletic poses of the baseball player and the figure skaters demonstrate the muscle systems used while playing these sports. If you decide to take the older kids, expect them to be mesmerized by the upside-down skateboarder and the gymnast on the rings. If you go, and I do recommend it, allow yourself time to explore and learn at this amazing exhibit and visit the dedicated gift shop adjacent to the space. I would reserve at least an hour to fully process BODY WORLDS & the Brain. BODY WORLDS & the Brain is at the Science Museum of Virginia Friday, May 25-Sunday, September 23. This exhibit is recommended for adults and children 8 or older. Timed tickets are available by calling 804.864.1400 or by visiting www.smv.org. 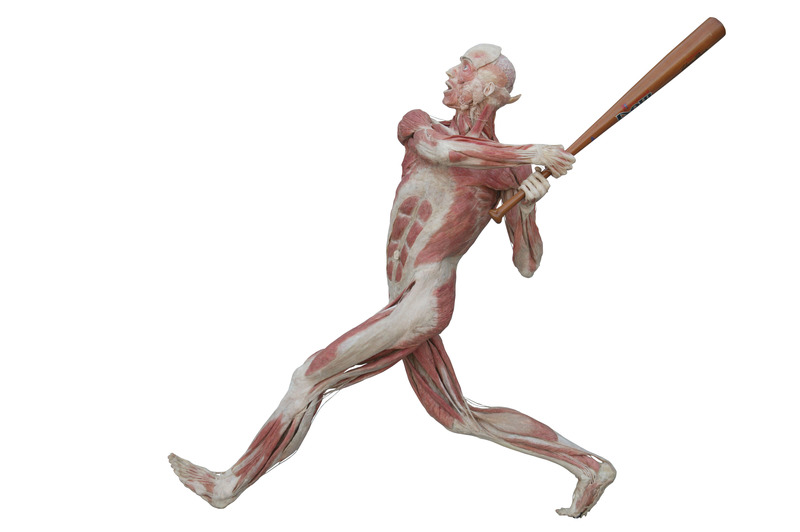 Body Worlds tickets are $14 for ages 4-12 and 60+ and $15 for ages 13-59. Tickets for members are $7.50. Tickets for Body Worlds and Museum exhibits are $19 for ages 4-12 and 60+ and $20 for ages 13-59. Audio tours may be purchased for an additional fee at the gallery entrance. Audio tour tickets are $5 for adults and $3.50 members, seniors, youth and groups. For more information on tickets, visit www.smv.org or call 804-864-1400. This exhibit is not included with your membership or regular museum admission.